Jackson Square: Way back in September, we broke the news that a pair of Circolo vets would be opening a steakhouse concept in the former Frisson space on Jackson Street, right next door to Kokkari. 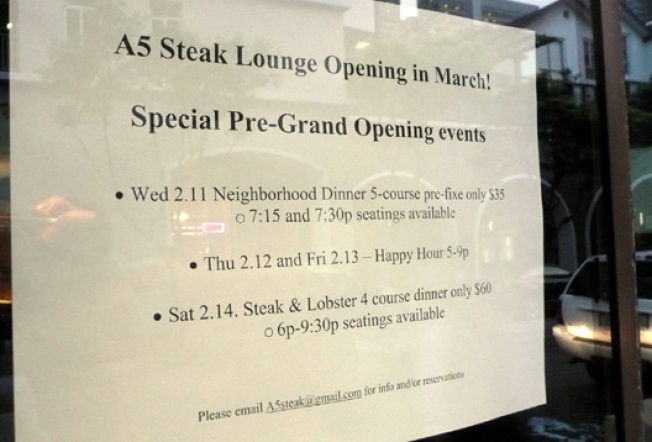 Well, from the looks of things, it looks like they've changed the working name from Alex to A5 Steak Lounge. We're not sure where the name came from (obviously somewhere between A1 and A16), but if the prices are as reasonable as the pre-opening specials suggest—the only way we see a new steakhouse surviving around now is with low, low prices—then we could have something here.